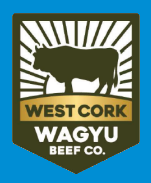 What is West Cork Wagyu Beef? Grass fed West Cork Wagyu beef animals produce an intensely marbled meat, which has succulent flavour notes and an increased tenderness, delivering a melt in the mouth experience for the consumer. Wagyu beef is fast becoming one of the most desirable meats in the world. Described as the Foie Gras of beef, Wagyu has become famous for it’s intense marbling. It is this marbling that produces a tender, juicy, naturally enhanced buttery flavour to the meat, which cannot be rivalled in tenderness or juiciness by any other beef. Unlike a typical fillet steak here, which is tender in a textural or consistency way, Wagyu beef is tender in a “dissolves in your mouth” way. Consuming Wagyu is a decadent experience. It is a healthy beef, with a higher percentage of Omega 3 & 6 fatty acid content as a result of the intense marbling, due to grass feeding. The meat has intense flavour notes which develop in the cooking process. The meat is tender and often described as “melt in the mouth” experience. It is a unique product, with pedigree quality and a new experience for your palate. Omega 3 fatty acids – protect against heart disease, arthritis, depression, Alzheimer’s, high blood pressure, and have anti-carcinogenic properties. Monounsaturated Fatty Acid to Saturated Fatty Acid ratio is higher in Wagyu beef than other beef. Much of the marbling in a Wagyu carcass is comprised of monounsaturated fats. Even the saturated fat contained in Wagyu is different. It contains a high quantity of a version called stearic acid, which is regarded as having a minimal impact in raising cholesterol levels, making Wagyu beef very beneficial to human health. Where can I try Wagyu Beef? Many of the most affluent restaurants along with their Michelin-starred chefs are now serving Wagyu beef to their discerning customers. Our Wagyu Beef is available in our Online Shop and in many restaurants of note.